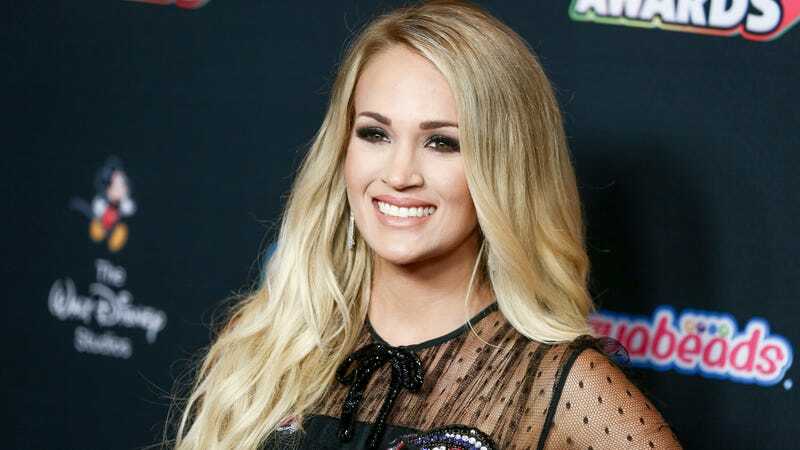 Carrie Underwood stopped by Ellen to promote her new album Cry Pretty (which will probably debut at #1 on the Billboard charts), and when asked about the accident that left her with more than 40 stitches last year, provided what might be the most candid and detailed description of what happened. In addition to the facial injury, Underwood tells DeGeneres that she also chipped the bottom of a tooth. “I didn’t realize how bad it was [at first],” she says, adding that she was alone when the incident occurred. When the extent of the injury became a little clearer, she called up her team and they took action. “My biggest worry at the time was if I say nothing, then later on… I feel like people are gonna say, What has she done to herself electively? This is all pretty much what I expected: she was worried she’d look a lot different after healing, but—surprise! (and congrats? )—she doesn’t. I’d love to throw in a video embed, but Ellen uses something called Ellentube that is one of the most frustrating, insufferable things on the entire internet! So you’ll have to click here and scroll to the bottom to view it. On Thursday 20 September, Meghan will host a celebratory event at Kensington Palace for the launch of the cookbook Together. At the event, Meghan will help the women involved with the scheme prepare a meal before themselves and more guests sit down to enjoy the tasty feast. I like Sharon Stone’s dogs. That’s all!